Winner of Pro Audio Review"s Par Excellence Award! 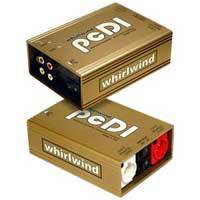 The Whirlwind pcDI is perfect for interfacing the outputs of CD players, computer sound cards, iPODs and MP3 players, tape decks, etc. with professional, balanced, low impedance equipment. This unit contains two separate DIs - input your signals with one 3.5mm (1/8") mini TRS stereo jack (tipleft , ringright , sleevecommon negative) or two sets of color coded RCA phono type input and through jacks. Output is via corresponding color coded XLRs.